Angelo Rither was born on December 11, 1999 in Orlando, FL to the parentage of Maxia Rither. “LoLo,” as he was affectionately called by his family and friends was a blessed bundle of joy. He began his education at Pine Hills & Hiawassee Elementary where at a very young age he warmed hearts. Angelo continued his education at Piedmont Lakes Middle School, where he touched many lives. Being autistic did not stop Angelo to overcome all obstacles. His tenacity and courage allowed him to advance on to Wekiva High School. As a son, Angelo was very protective of his mother, taking her hand everywhere they went. He also loved his brother, Kingwood, where they enjoyed spending lots of time together. Angelo enjoyed watching movies. He was a funny, caring and friendly young man, inside and out, who had a love for his family that exceeded all. Angelo loved attending church with his mother. He was excited every time he had to get ready. LoLo was a natural charmer with a smile that would brighten up your darkest days. A son, brother, nephew, cousin and friend – all of which he was proud to be and will never be forgotten. 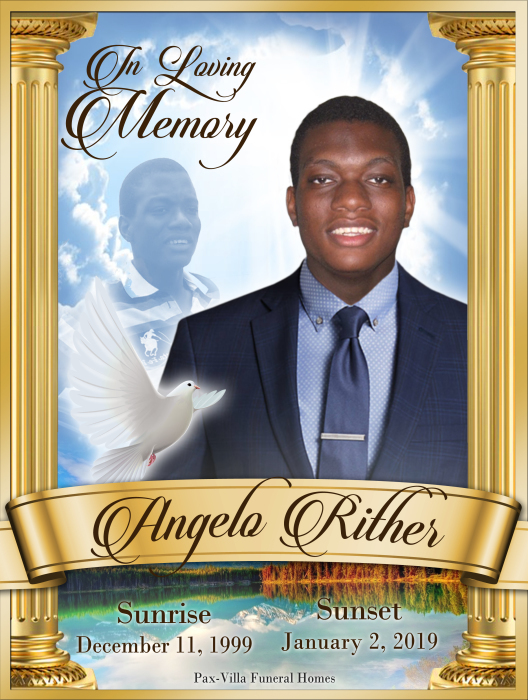 On Wednesday, January 2, 2019, Angelo entered-into rest and Heaven gained an angel. He will be remembered for all his kind ways towards everyone. A child of God has gone to be in Paradise. His Many Cousins: The Rither Family, The Colin Family, The Gilot Family, The Jean- Pierre Family, The Achille Family, The Belizair Family, The Baltazar Family, The Senecharles Family, Duclairvil Family and many more. His friends, classmates and teachers affected by this loss.